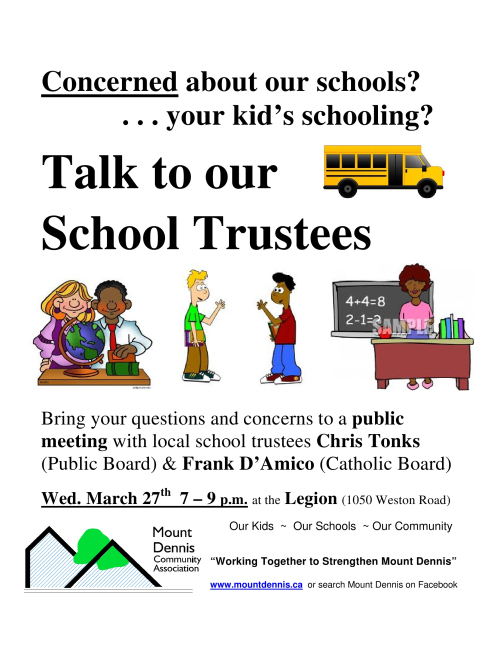 Local school trustees Frank D’Amico and Chris Tonks are holding an open house tonight, March 27, at the Legion in Mount Dennis. I’m still too close to death to go, but if you wanted to, you could go and ask, say, about before and after care, a source of much concern in light of the recent announcement that Weston Village Childcare may be closing. Why has such a meeting not been setup in Weston? Why is the is this notice going up same day as the meeting? It didn’t go up until today because I’ve been busy. Kids, job, cholera, and all that. Previous Previous post: Got cholera. Didn’t die. Couldn’t write.